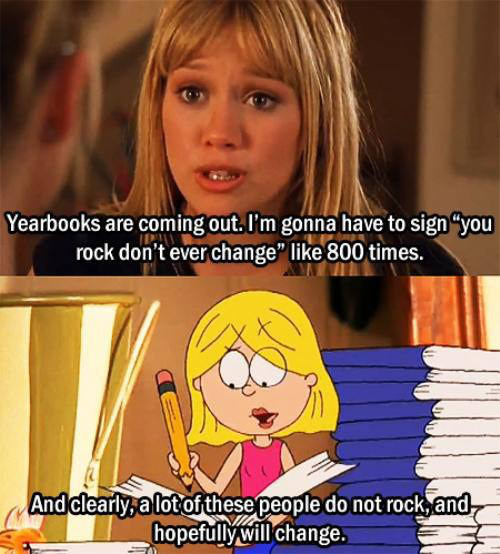 Back when Disney channel had shows with meaning, there was a little show called Lizzie McGuire. 1. Good friends are hard to find. 2. Sometimes you have to be blunt in order to get what you want. 3. Growing up is hard. 4. Embrace your inner diva. 5. Things will get better with age...hopefully. 6. It's okay to be a little weird. 8. Be yourself. Unless you can be an Italian pop star. Just kidding. Be yourself. 9. People will come and go in your life, but the one's that really matter will always be there. 10. Know that at the end of the day, it's always okay to stuff your face with cookies.